One of the most anticipated moments of your wedding reception is the first dance. As the big day gets closer, couples start deciding what they want their moment to be like. Many couples also realize that they need some help in the dancing department. Your first dance does not require years of preparation. However, some couples decide to take ballroom dancing lessons to ease their worries. We refer couples to the Boston Ballroom Dance Center, where they can learn ballroom basics from professionals. Use any opportunity to whisk your partner away on the dance floor. Don’t forget to have fun while you’re doing it! Just like the rest of your wedding, your first dance is meant to represent you as a couple. You will need to trust one another. The best dance partners trust each other. With this trust, comes fluidity on the dance floor. In the end, your first dance is not about your guests and what they think of you. You’ll remember this day forever, so do your best and enjoy the moment! 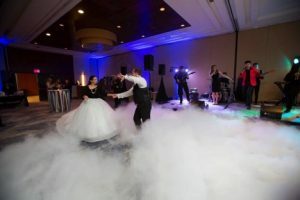 Here is a short list of songs that The Knot suggests as best wedding songs for your first dance: "Amazed" by Lonestar, "As" by Stevie Wonder, "At Last" by Etta James, and "Better Together" by Jack Johnson.